This is a genealogical map of Jesus, from the creation of Adam and Eve through Noah, the tribes of Israel, King David, and finally Joseph and Mary. It includes everyone whose ancestry can be directly traced all the way back to Adam and Eve according to the biblical record. 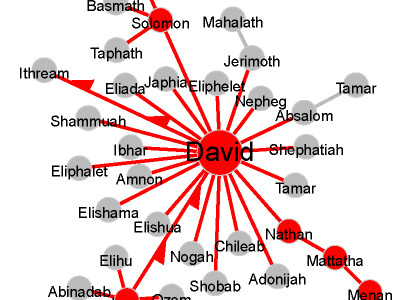 The map shows only father-son and father-daughter relationships, with the exception of Mary, who is shown as the spouse of Joseph and the mother of Jesus. 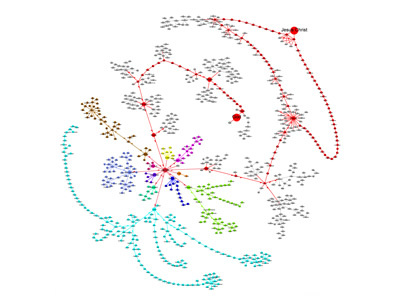 Some relationships may also indicate a more distant ancestry than the usual father-child lineage. Red indicates the bloodline from God the Father to God the Son, Jesus Christ. Other colors show the twelve tribes of Israel (descendants of Jacob).